Yesterday it was below zero when we left for work. Yes, below zero — and that didn’t even account for the windchill. That’s the kind of cold that calls for two pairs of socks, long underwear, hot chocolate, and chicken pot pie. Thanks to Cooking Light, this is a comfort food dish that doesn’t leave you feeling terribly guilty. 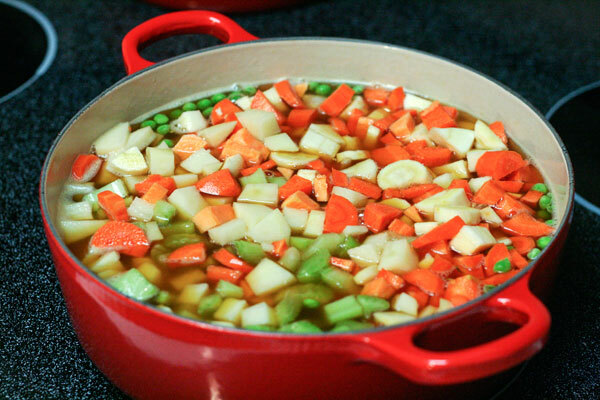 It includes peas, potatoes, parsnips, pearl onions, carrots, and celery. (You can really use any root vegetable from your refrigerator.) And the sauce is rich, but not too heavy. 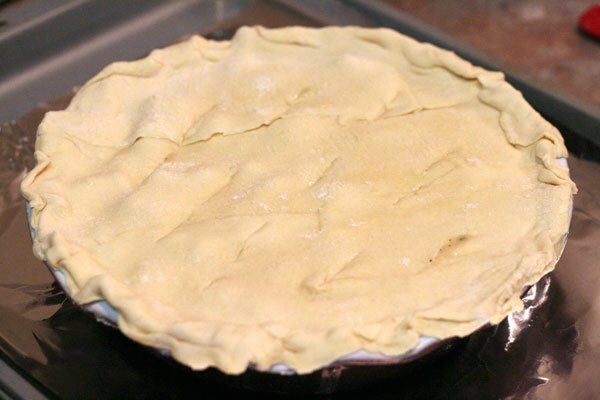 We simplified our pie by covering it in puff pastry, though you could also make your own crust. Puffy, flaky, and filled with piping hot goodness. So if you find yourself facing a zero-degree day (though I would never wish that upon anyone), I highly recommend this dish. What’s your favorite cold weather comfort food? Bring both to a boil in large stock pot or Dutch oven. Add peas and vegetables (through onions), and simmer 6 minutes. Add chicken, and cook 6 minutes until chicken is done. 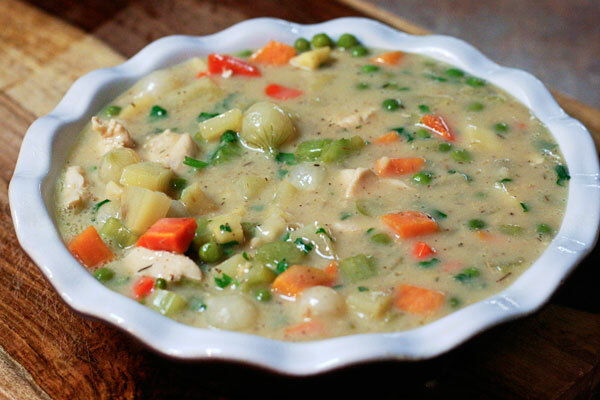 Remove chicken and vegetables with slotted spoon and place in separate large bowl. Increase heat to medium. Measure 2/3 cup flour and add all but 1 Tbsp to a separate bowl. Gradually add milk, stirring with whisk until well blended. Add milk mixture to broth on stovetop. Cook 5 minutes until thickened, stirring frequently. Add chicken and vegetables, parsley, thyme, and salt back to pot. Grease 2 large pie plates, and spoon mixture into them. Sprinkle remaining 1 Tbsp flour onto work surface. Roll pastry dough into 2 circles. Place over chicken mixture, pressing to seal. Cut small slits into dough, and coat lightly with cooking spray. 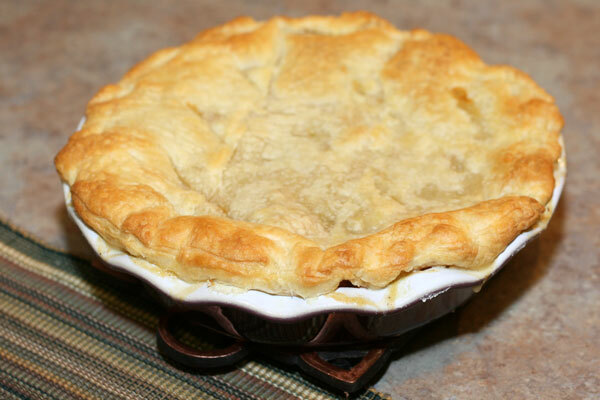 Place pie plates onto foil-lined rimmed baking sheet. Bake for 16 minutes until pastry dough is well browned and filling is bubbly. I love Cooking Light for recipes like this. Simple substitutions can really “healthify” a meal without sacrificing flavor. I should have made this to survive the Arctic blast in Boston yesterday. It was SO cold!! Below zero!!! I would die. 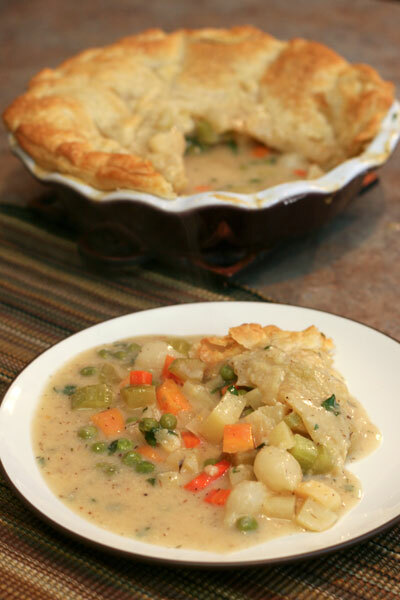 Sounds like a pot pie is perfect for a freezing day! YUM! I must try this one! I make potpie all the time, but with peas, carrots, and onions. This is a great way to add some intrigue to my old standard!